Once, not so long ago, I’d have said I had a myriad close friends: but years, events, situations, death, and many other things, take toll of some of those friendships. People I once walked with and they with me, are no longer there. Some choose to go in another direction. Some fall away – not just from friendship, but even the faith. Others – you realise to your sadness – have ‘used’ you to promote themselves. Others still have been ‘covertly’ undermining you in order to ‘take over’ what you’re doing . Others, still, who’ve listened to rumours, heard one half of a story and never checked out the other half, and without warning, walk out of your life on the basis of a lie. I’ve had a number of them, in each category, sadly. Faithful are the wounds of TRUE friends, who help – often with hard-hitting words – point out where things went wrong (and in all the ‘failed’ friendships, I’ve failed, too). I’ve been privileged, over the years, to take with me to foreign countries, especially Colombia, some of those I call good, true, close friends: men with whom I’d share pretty much anything going on my life, bad and good. But there are the faithful friends. Through thick and thin, hell and high water, rocks and hard places, those who’ll stand in front of you to take what comes when the **** hits the fan. I’m so grateful that I have more than a few of those friends, a good number here in lovely Cali. It’s always a joy to go to Mision Abrigo Internacional: a curch planted many years ago by European missionaries, Hein and Teija Hoere (Dutch and Finnish). They’ve been here 30 years now, and since my first arrival in Cali, they’ve become closer and closer friends. Hein (Hendrik) was my first translator here: he was brilliant, and I felt honoured and humbled that such a committed and visionary man – with Teija equally committed and visionary – should translate for little old me. Since then, and occasionally staying in their home in the early Cali days for me, I love and respect them not only as apostles, preachers, and leaders, but as friends. 18/19 years on, we get on so well, and they’re an intrinsic part of my feeling that this wonderful city is genuinely my second (pushing for first?) home. 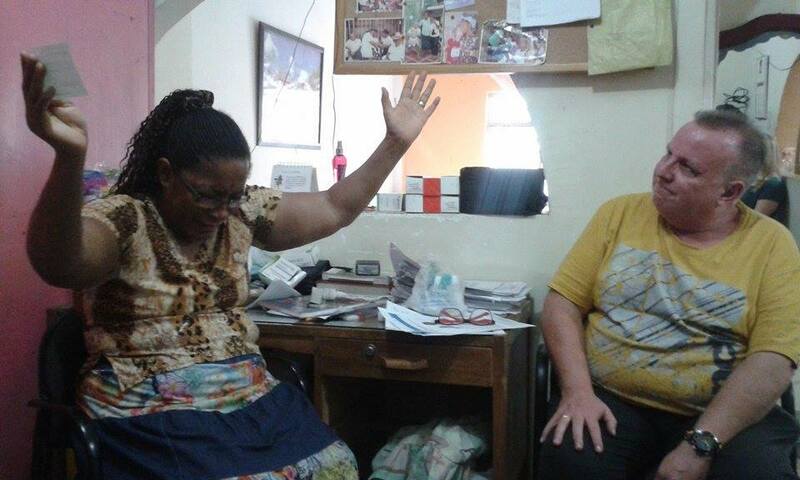 Their church is testimony to their leadership, apostolic gifting, and the release of others into ministry. Hein and Teija still live in Cali, but spend a good part of the year planting churches in Bolivia. Two men lead the church now: Jhon Jairo Gonzalez, and a man I consider one of my very dearest friends in the world, Wilmar Gomez. These two lovely men are a testimony to real apostolic/pastoral ministry – trained, given responsibility early, then released into ministry. Wilmar is a man I would use as an illustration if preached on Matthew 0:26 – ‘If you want to be great in God’s Kingdom, learn to be the servant of all’. The worship at Mision Abrigo is wonderful: you don’t even have to know Spanish to get totally caught up in it. They have so many people who are worshippers and worship leaders, they rotate the musicians and yet it is as good every Sunday as it was the previous one. At their church, God did some wonderful things: all of us saw most, if not all, we prayed for, healed. I got knees first up (!!) – osteoarthritis – instantly gone. Spinal pain, hearing deficiencies, kidney disease, gastritis – one lady with chronic gastritis pain testified to the Pastors and then in church last Sunday that it wet instantly. God’s good…. I didn’t know until last week that Cristian, the drummer – I thought I’d got him in this photo but sadly not – had had such a damaged arm some time back, that there was never any chance of him playing the drums again. In fact, if I recall (put me right, MAI guys!) that he might have lost his arm at the time. Cristian is ‘drum crazy’ – he lives for his drums, and it was such an answer to prayer for him when he was given a drum kit…a even greater answer to prayer was that, following his injury, I’d had the opportunity to pray for him (I’d forgotten, I hate to admit) when his arm was totally healed… his drumming has got louder and better ever since! Not so much chance to blog the last couple of days: but so much as happened! Wonderful meeting at Iglesia Casa de Oracion Rey /Jesus – one of my favourite ‘always-return-to-if they’ll-have-me’ churches. 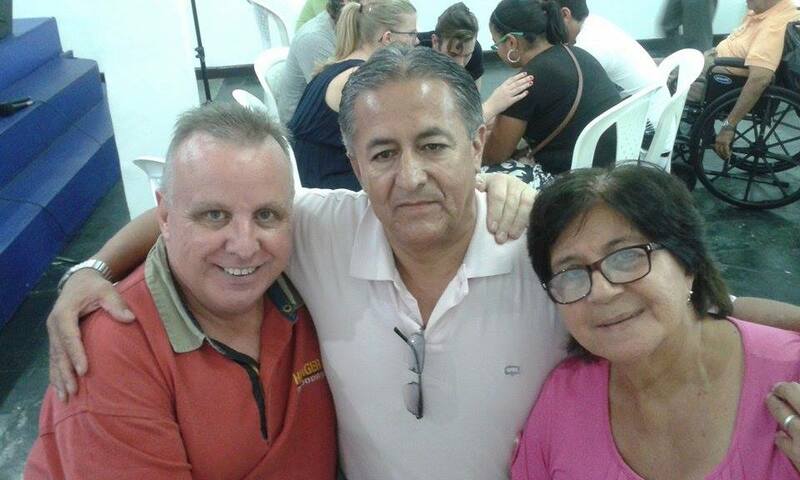 The Pastors, Diego and Candy, have become great friends over the years, and so many people in the church have, too. 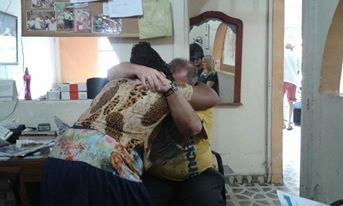 It’s the church I might have mentioned before, where some wonderful miracles have happened in healing /ministry times – like Astrid, healed 7 times of 7 different cancers… the church where I prayed for one lady, in Spanish, with breast cancer…I have to say ‘breast’ isn’t in my ‘everyday Spanish vocabulary’! – and when I asked her where the cancer was, she pointed….instead of saying the word. Off I went in Spanish…and then came to one of those ‘dread’ moments when you realise you have to use a name, or a word, you don’t know… and I’d left myself with no get out option, I had to use ‘breast….’ Lord, help??!! I was still a few words away from needing to speak it, so my mind was in overdrive. I could only think of ‘tetas’ (bad boy!) – no translation needed, I’m sure! – and knew I couldn’t pray….’yo ordene este cancer en su teta se va ahorra’ in a prayer (my Spanish is a load of tetas sometimes!!!!! )…then, brainwave! 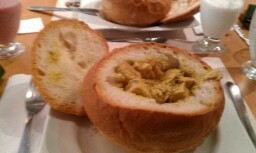 ‘Breast of chicken’!! – pechuga de pollo. The relief!! NOT!!! So many stories….one phenomenal miracle in those countless testimonies, though…. 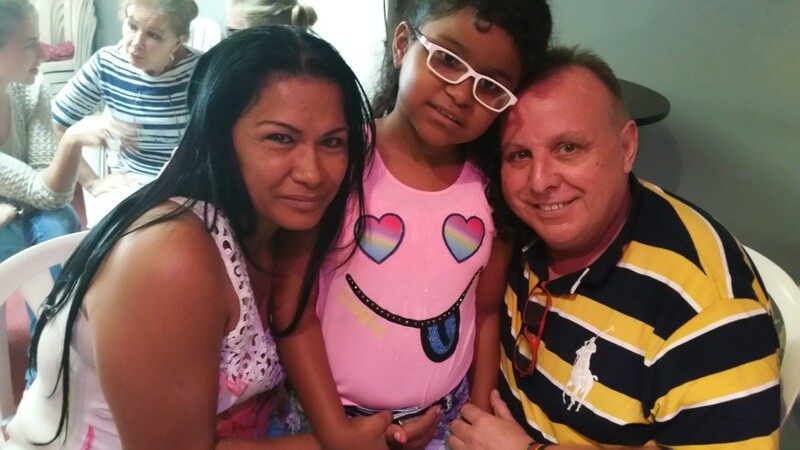 In July, my lovely Pastor friend, Wilmar, was in the church ‘Dios con Nosotros’ with me: his sister, Olivia, was there, too, with her daughter, Maria Jose. Maria Jose is 9: for 4 years, she had been wrecked by a very rare and fast-destructive brain tumour, that spreads like a spiders legs, around every available part of the brain. Life had been hell for her, I can’t even imagine: and for Olivia, hell filled with fear for her lovely daughter. Olivia would say herself that, up until then, she was at best sceptical, then cynical, and at worst – unbelieving in miracles. BUT…when there’s nothing that can be done, it’s amazing how God’s grace steps in, and out of the desperation for a miracle – God or not – it can drive you straight into God’s embrace. All Maria Jose had as options were more surgery (many in the 4 years already) and more chemotherapy. It was one of ‘those’ situations where I heard words coming out of my mouth that I’d neither thought, processed, or ditched!! – involving Maria Joe’s healing. 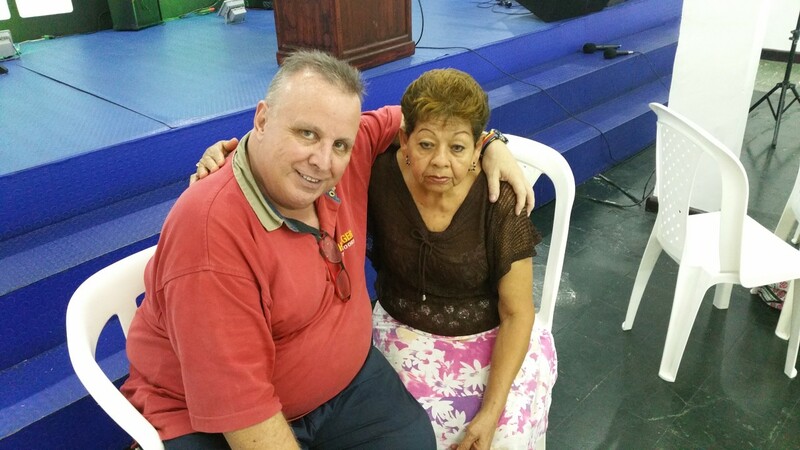 Sunday, Olivia came to Wilmar’s church, where I was preaching…having already trumpeted across Facebook the testimony of Maria Jose’s miracle, with documented hospital proof. The cancer has gone completely: one or two ‘residual’ issues that God’s working on, like full restoration of her eyesight. Over the years, Maria had often said to her mum, ‘When will I be like normal little girls?’. That must be heartbreaking for a parent to hear. Now, she is: will be increasingly. AND, I am convinced, will catch up and overtake school colleagues when she is back at school, as her brain is now ‘supernatural’! The blessing didn’t stop there: God healed Olivia of a lot of back pain (she needs her back: she’s a teacher of roller-skating! – and one or two other things, as well, including…. (trumpet voluntary! )… knee pain! Olivia wanted to testify to the church about the miracle, waving the hospital letters like a victory flag. 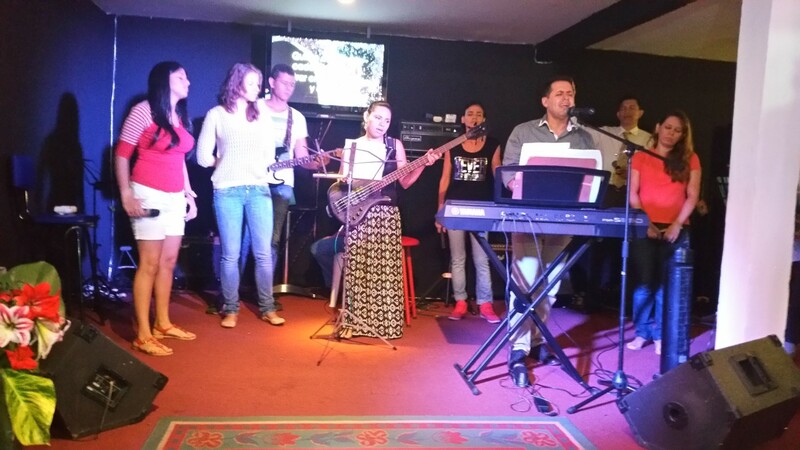 And then dear Maria Jose thanked Jesus and people for praying, over the microphone… HEAVEN TOUCHING EARTH!!!!! Here’ Olivia’s written Facebook testimony… I’ve left it ‘as is’ because it’s THEIR story, and if it takes you some moments to re-arrange some words, it’s lovely to read…. I want to give a testimony. The appointment for me to read the results of the scan was in March in February fell my daughter began vomiting and loss of balance knowing that I had to wait so long for me to read resonance. I take her by the medical emergency in February he said that the waste is too small to operate and were 2 residues. Wait until March to look at the appointment the neuro surgeon. 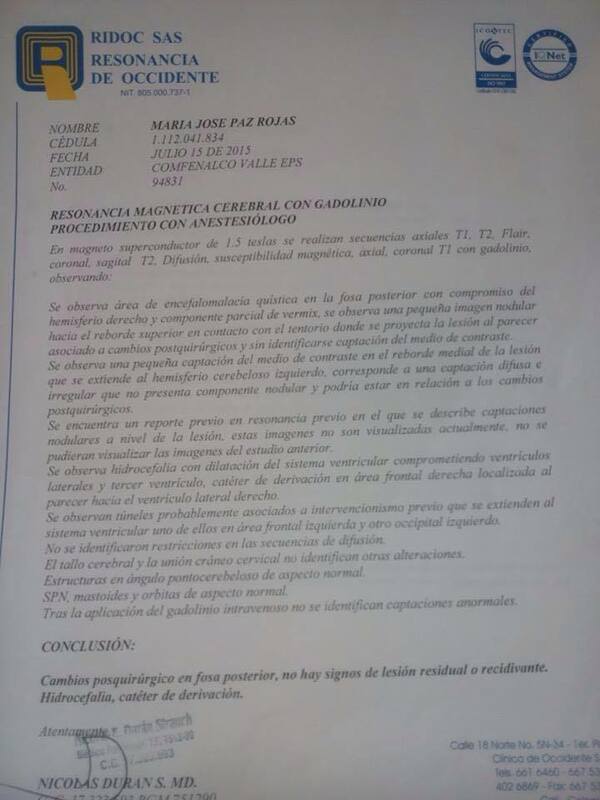 He said that if he had 4 residues and had to take another MRI and the recommendation is to make chemotherapy. I told the doctor that I operate my told me he could not do chemotherapy because the tumor became malignant. Reach worried that theme home chemotherapy and disconsolate ask me the appointment for my daughter resonance begins to lose his balance is struck with the edge of a sink, hit in the mouth and so on my missing a resonance month to take my sister dary light asking me to relocate the child to healing did not know nor the place nor the people wherever we went but felt watched us with curiosity my daughter wanted to go to the bathroom one lady accompanied us to because we did not know where were the bathrooms. He says the lady can take your girl and told her to pray if you already left that the bathrooms and hear the Mass and the time came where called to pray for the sick and his work of healing the pastor close friend of my brother also wilmar .well Shepherd is the objective was met’ll do very sincere was not like this subject very apathetic returned home a week before the resonance another pastor friend of the father of my daughter went home and pray for my daughter. Now came the day of its resonance given the results you can see it says July 15 and was told now will wait until September to be read Dr. had a feeling and keep it until this afternoon the doctor read it or surprise They were gone god mine waste I could not believe I could only hold my tears hug my daughter and tell these healthy gosh grace Luz Dary wilmar the lady who pray for my daughter to the pastor who came to my house only say that siiii healing Masses serve God forgive me if you ever doubted you. Walking blessings! – God turning up big time last night! The God bit first….last night, we were in a church I went to in July for the first time – I don’t know the name, but the pastor, Hector Fabio Rios, is a lovely man. Again, Kristin and Andreas both spoke really well: Kristin about the woman with the issue of blood (which, as she started, I pointed Andreas to my Bible and my bullet note (freudian slip for Colombia, huh? – bullet note!) – about the woman with the issue of blood!!) – and Andreas telling testimonies of Jesus, raising faith with almost each word. I found myself ‘winging it’ again (I still find that both wonderful and scary, even after all these years!). I think this lady’s name is Carmen: she was healed of so many things the other evening…. 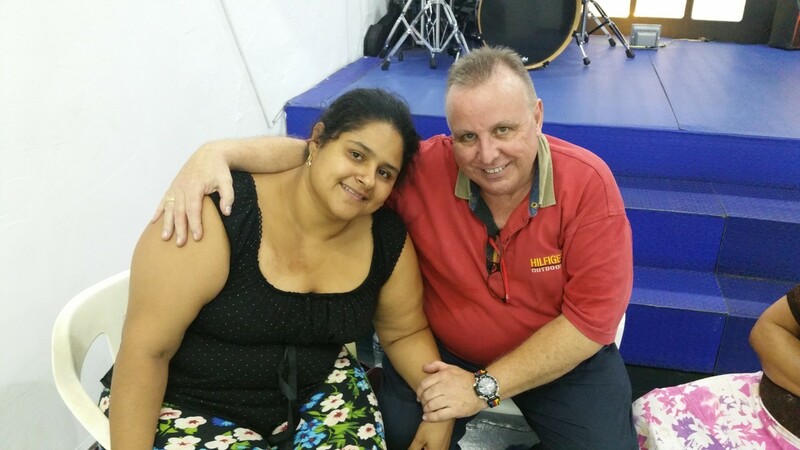 …a young woman with acute ovarian problems, prayed for in July when I first visited Hector’s church, was healed then, and healed of body pain this time.. Yesterday evening at a church meeting we prayed for people in the end. God really showed up and it was fantastic. An old man in a wheelchair could put his hearing aids in his pocket and felt new strength in his legs. His wife got her hearing back in one of her ears after being totally death on that ear. Another family got really touched. The father got his hearing back on one of his ears. 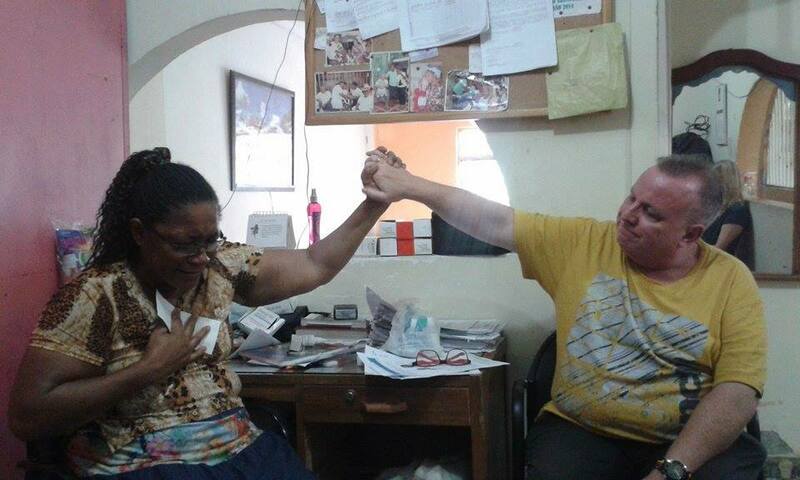 The mother got strongly touched by the Holy Spirit and felt a coolness in her arm where she had been shot. The son felt that his breathing improved, he had problems with his nose. Another girl felt pain leave her feet. She had had surgery done because of pain and disfunction. We prayed for more people and I’m sure that God touched them to even tough they could tell if they were better at that moment. He is really on the move in this place! 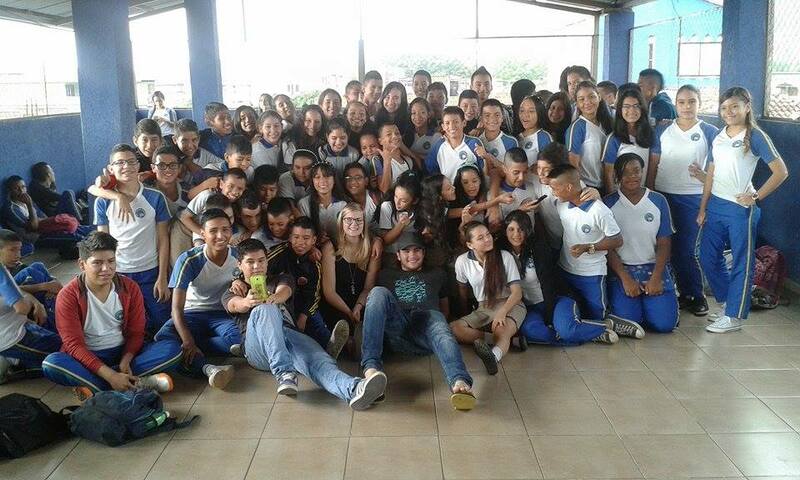 Visiting Ana Beiba was a fantastic experience. Such a woman of God! All the old people that she took care of would without her love and caring be out on the streets and many of them probably dead. And to see her struggling with her pain just walking was hard because you could just imagine how much work it must be. 120 people and she had some other ladies helping which was necessary. The happiness, pure joy and thankfulness that filled her face when she realized that the pain was gone was absolutely breathtaking. I am thankful for that I could just play a little part in praying for her when God healed her. 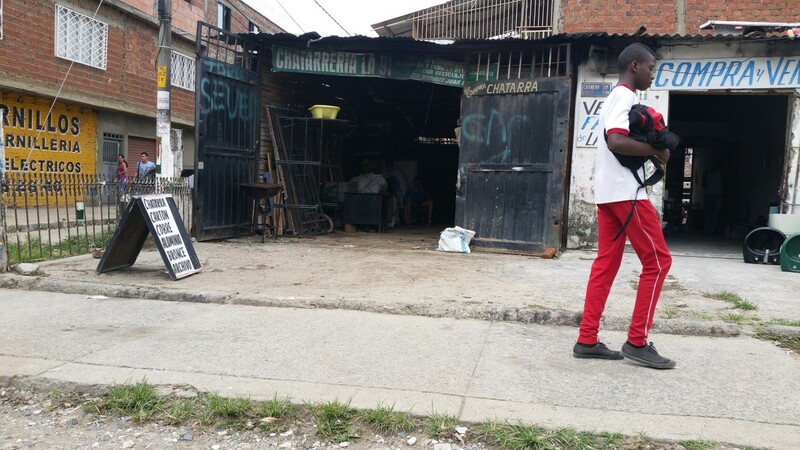 I felt this post needed its own space, having reported on the visit to Ana Beiba yesterday. Her foundation is groaning under the weight of numbers of abandoned old people. There is provision to extend her existing houses now, but only by one storey. The ‘babies’ are packed in – happily, I’d add – to the existing accommodation, but do need more room…. And so, the building on the corner of her road – it’s actually two shops on a large piece of land – are up for sale. November and December are the worst months for the ‘volume’ of elderly people being made homeless: Christmas, New Year expenses – Cali is world famous for its ‘Feria’ – a week long party between Christmas and New Year, and old people get ‘jettisoned’ to make more money available for families for the 8 days of festivity. 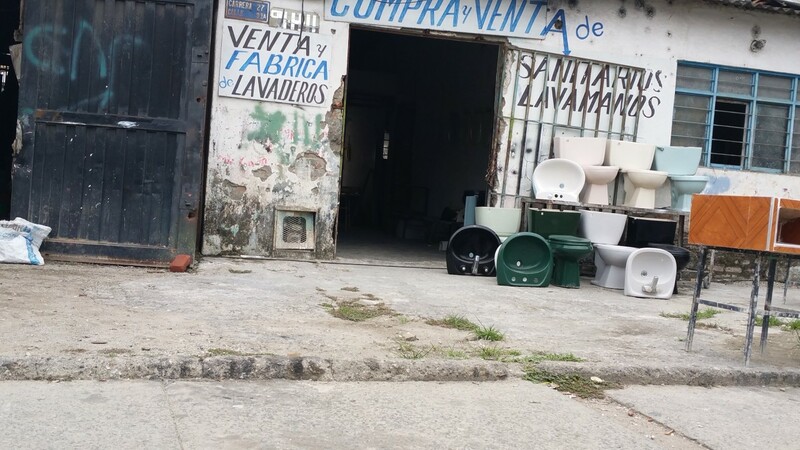 The shops actually sell, among a limited number of other things, reconditioned toilets (!!). The price is 150,000,000 pesos (£36,000): it’s huge, but will need a large amount of work/expenditure to make it live-able. I’d dearly love to get a volunteer team of builders, carpenters, decorators, electricians, plumbers, etc., to come over and ‘blitz-build’ the house: for skilled people, it probably could be done in less than a couple of weeks, and those coming would also have, of course, the opportunity of living under the spiritual open heaven that is Cali: pry for the sick, preach, see healings and miracles a plenty. And, of course, to raise the money to buy it: the owners are wanting to sell rapidly (it’s been up for sale for some time). It’s currently rat-infested as I said in the previous blog, and a health threat to the old folk, until it is remodernised. And, being next door, it can be internally connected by knocking down walls. It’s perfect…. If you can help…funding, practical… please let me know. If you could come here for a couple of weeks if you’re a skilled worker (my woodwork certainly doesn’t come in that category! ), then can you let me know, please? It IS desperate! 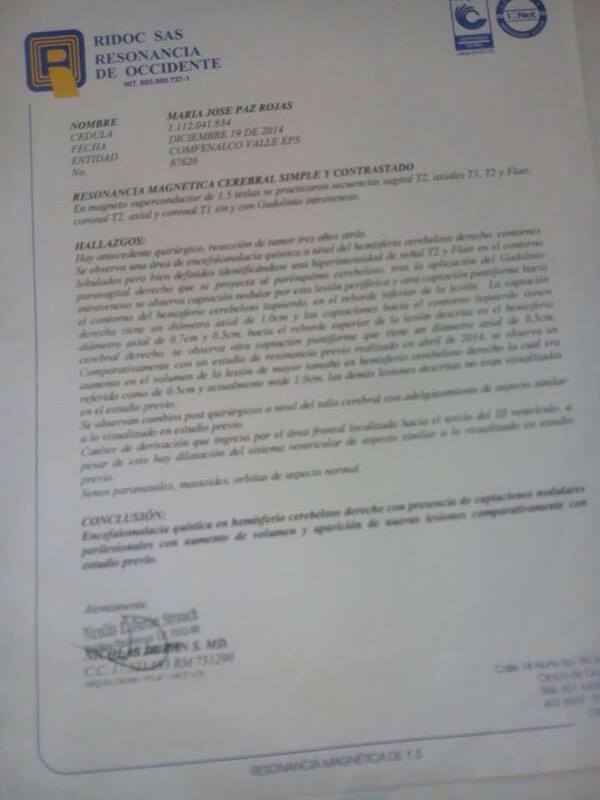 Wonderful Ana Beiba…major physical miracle for her…Barrio Compatir…School…. 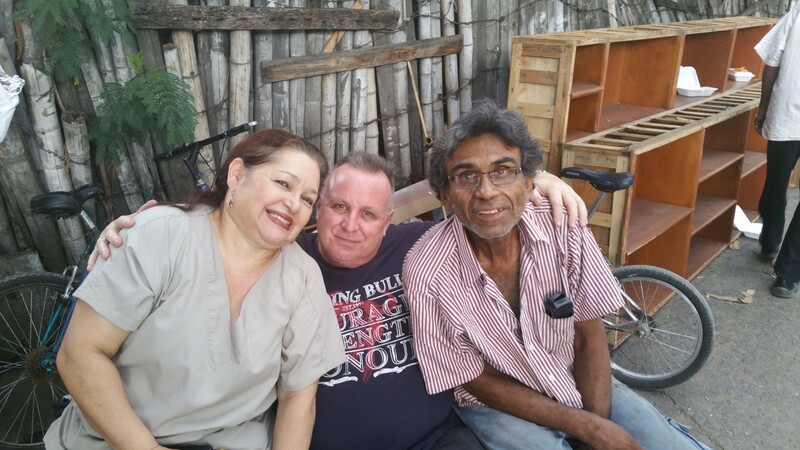 Where do I begin, again, to write about Ana Beiba, and her home for Abandoned Old People? It’s not a case of repeating myself, because she’s always got new plans to take in more old people, extend this faith ministry further and further…. I sat and chatted for a while whilst Andreas and Kristin had a guided tour: they were amazed at how organised, orderly, and tidy it was: not enough beds, but often they sleep two to a bed. 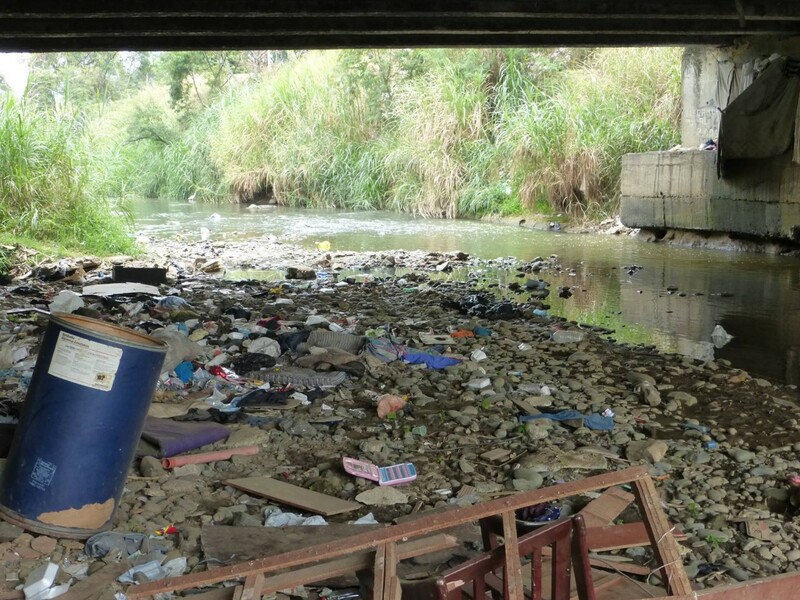 That has to be significantly better that sleeping under wet cardboard under a bridge or in a gutter in the rainy season…and this week has some amazing rain….a massive storm blocked major roads with lakes: took out the traffic lights…and, by Colombian’s standards, it’s not been warm (29°C+ day, 22°C at night!!). Many people as yet not rescued by dear Ana will have died. I asked her about her vision: the double-fronted ‘shop’ on the corner (large building, but rat infested, with many other creatures that provide significant threat health wise to her babies) is up for sale. It’s attached to her houses, so could be knocked through to make one huge place, and, probably, accommodate 200 more. 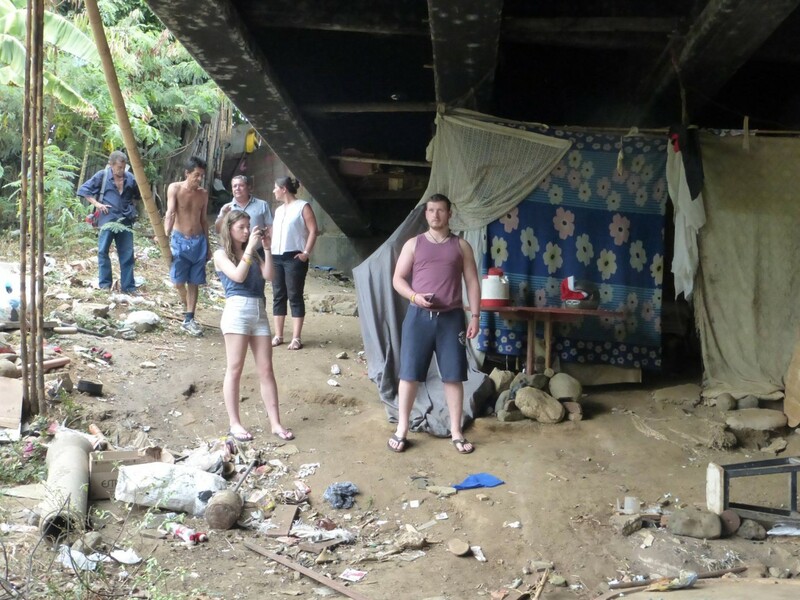 She’s offered to buy it… 150,000,000 pesos (GB£35,000, so around US$55,000, AU$72,000)…November and December are the two worst months, she told me, for homeless old people, as families turn them out to finance Christmas, and hospitals want accounts settled by the end of the year…. I guess I don’t need you to tell you what I want to do….??!! Handing over the cheque for 50,000,000 pesos (approximately GB£12,000) to complete the construction of her second house (the one above will the numbers 3 and 4), instantly produced a typical response: arms raised to heaven, thanking God, praying….no singing this time as I think her hip pain muted her a wee bit. But no…she fell to her knees (osteoarthritis and kneeling down I know all about!! ), and came, on her knees, to hug me, strangle me, suffocate me….we were both in tears. Getting her up off the floor was a major exercise, involving Andreas, Kristin, Wilmar, and me… thank you, thank you, thank you, to a certain dear friend back home in England who has facilitated the building project (over the last 2 years, £33,000 more, too)…. I asked her about her walking problem: acute osteoarthritis of her left hip (God’s sense of humour and osteoarthritis and me is still something I can smile about…just hope I can KEEP smiling until he finally blesses me with my turn for healing!). Ana has many stairs in her home, including a difficult main staircase that is narrow steel with a sharp bend…she has to lift her babies frequently, and it was proving more and more difficult. I’ve been involved with Ana and her project for 4-5 years now: God has healed her three times of ‘terminal’ prognoses for cancer, so we set to on her hip on Thursday. Within moments, she was up, bouncing up and down on both legs, and THEN the one leg that had been crippled, dropping to her knees, getting up straight away unaided… thank you, Jesus!! She was deliriously happy….so was I….if, at the same time, having to ‘fight back’ the tiny, tiny twinge of ‘please, Lord…?’ for my healing…. Many more testimonies which I’ll get Andreas and (they’ve been absolutely brilliant, fantastic to have here, and so on fire for God) Kristin to write about….and back to the apartment after a long, emotionally draining day…. At 7am Friday morning, my lovely Swedish friends were up, and at a school to speak for an hour or more…. children are just not my ‘calling’ (!! ), so I felt it prudent to rest my recently injected and treated legs with a bit of tlc…. many kids prayed for…they had a great time! Names of people have already been ‘stolen’ from my head, but a lovely guy, involved in an accident about a year ago, where he lost a third of his brain. The miracle here is that he is alive: not just that, but walking, talking, living a normal life…how can God do that? – but was in pain in other parts, in the pancreas/spleen regions… it all went. A lady who by profession is a masseuse/ physiotherapist, was finding her job impossible because of her own pain – major problems between the 6th and 7th vertebra, intense pain causing loss of strength in her arms and hands. God healed her. Frank, another with intense pain just below his ribcage, undiagnosable, it seems, was healed. He also had an undiagnosed problem with extreme pin in his feet (not plantar fasciitis, or fallen arches), but crippling. Healed. Thank you Lord! Kristin prayed for a boy, Miguel, with back, legs, and heart pain, all as a result of drug abuse: off drugs for two months, all the pain left, and the final ‘hook’ of addiction was prayed out of him….Andreas prayed for a lady who had great pain in her hips, legs, and back – as a result of ‘leg length’ … her job has her standing all day (generally 12 hours), Andreas checked out her leg length, one was a good centimetre shorter than the other, it grew out, and all the pain left her… Another lady, stricken with pain, just began to laugh as the Holy Spirit fell on her, and all her pain went. I’m waiting for more testimonies from last night, but in their absence right now, I’ll post this and include them in the next log. it’s nigh on impossible to get work. He’s a lovely man, fluent in English, always gives me a massive hug when I arrive…. as does Ana Bustos. Ana is a high qualified doctor of opthamology: the pay for ‘non=private’ doctors here is not great, and she works ridiculous hours – yesterday, when we arrived, she done a 20 hour shift, then gone home to cook for 38 of her ‘children’, then with them for some hours….the dedication of her life to them humbles me. But gringoes don’t generally go to places like La Isla (The Island), and the fact that I always take all my guys there, just to BE with them, pray for them, and love them, brings her to tears. It is so, so humbling. God healed Ernesto in July: last week, he was sick again, vomiting up at least 4 pints of blood, the docs daid he should have died. They couldn’t find a reason, so sent him ‘home’… so the chance to pray for him yesterday was a real privilege, and the gratitude blows you away. One man you could see in his eyes that he was in extreme pain, terrible trouble standing up, and Andreas grabbed him, discovered the back pain, prayed, and it went away instantly. A huge smile on his face confirmed that he as pain free. Today, a number of events, including the very attentive doctor to my knees! 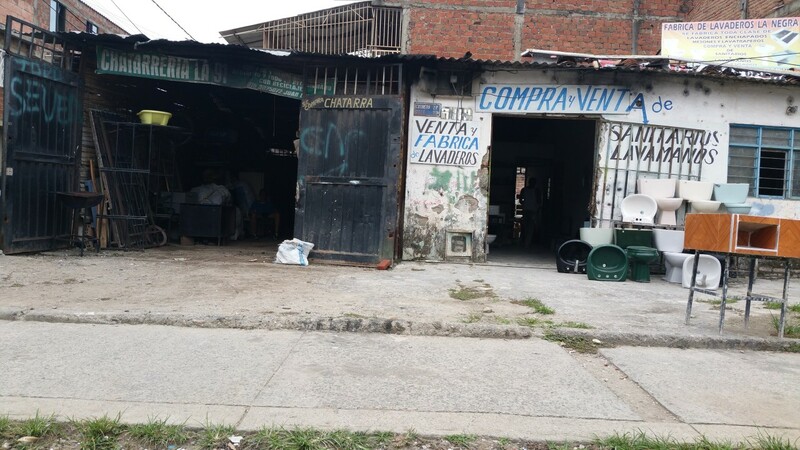 – Ana Beiba’s Home for Abandoned Old People, and a church in deepest Agua Blanca, a barrio named Compartir….a very distracting church as it is above a gorgeous smelling 24 hour a day bakery….